Once you’ve made a batch of Homemade Brownies, you’ll never use a box mix again! The perfect blend of fudgy and cakey and jam-packed with chocolate, your family and friends will love receiving this one bowl brownie recipe (minus 3 ingredients!) in a gift jar for the holidays – or just because! Cake, cookies, or brownies? What’s your jam? For me, they all have their proper places in life. Cakes are for birthdays, special occasions, and dessert at the end of date night. Cookies are the most fabulous snacks, and are the heart of the holidays. 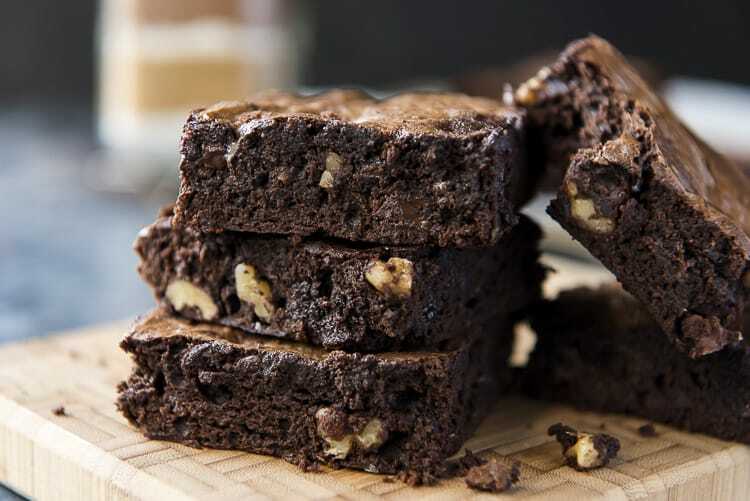 Brownies…now those are just perfect for every. single. day. Bonus points if you smother them in caramel, hot fudge, and ice cream, right? JUST TAKE ME TO THE HOMEMADE BROWNIES ALREADY! 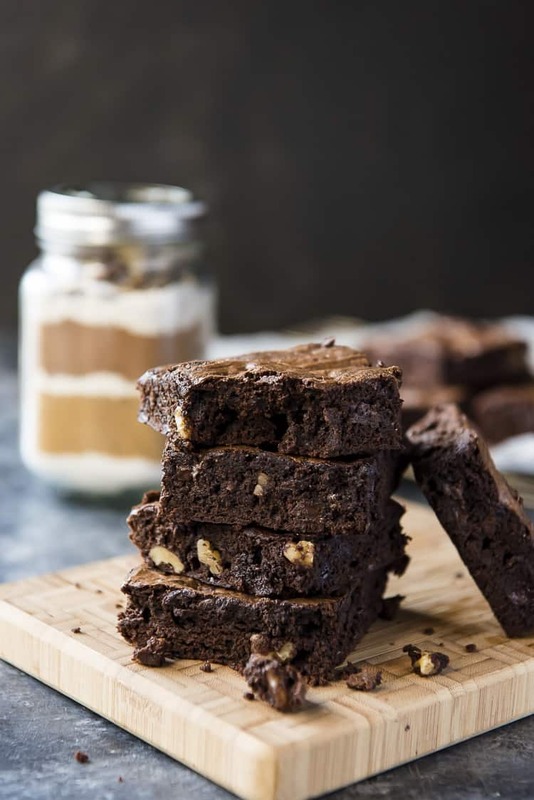 If you’d rather skip my (pretty darn helpful) tips and tricks, essential cooking info, and similar recipe ideas – and get straight to this deliciously easy brownie mix recipe, just scroll right on down to the bottom of the page where you can find the printable recipe card! There are two kinds of people in the world: Fudgy Brownie Lovers and Cakey Brownie Lovers. One is not better than the other, but I have always personally preferred the moist, chewy, fudgy brownie. Cakey should be left to cake, right? If you’re going to eat a cakey brownie, just bake a chocolate sheet cake and smother it in frosting. Brownies – to me – are meant to be dense and fudgy and even almost underbaked. However, to appease both camps, I’ve managed to achieve the perfect blend of fudgy and cakey with this Homemade Brownie recipe. And the best news? I put it all in a jar for you to spread the best brownie love to everyone you know! 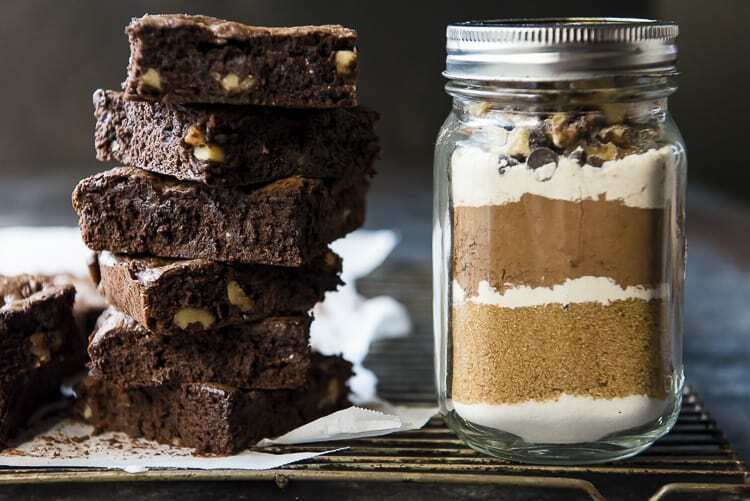 This Brownie Mix In A Jar recipe contains everything a box mix has – with a few tweaks and additions. All that needs to be added is oil, vanilla extract (I recommend Neilsen-Massey Madagascar Bourbon Pure Vanilla – they’re my fave! ), and eggs. 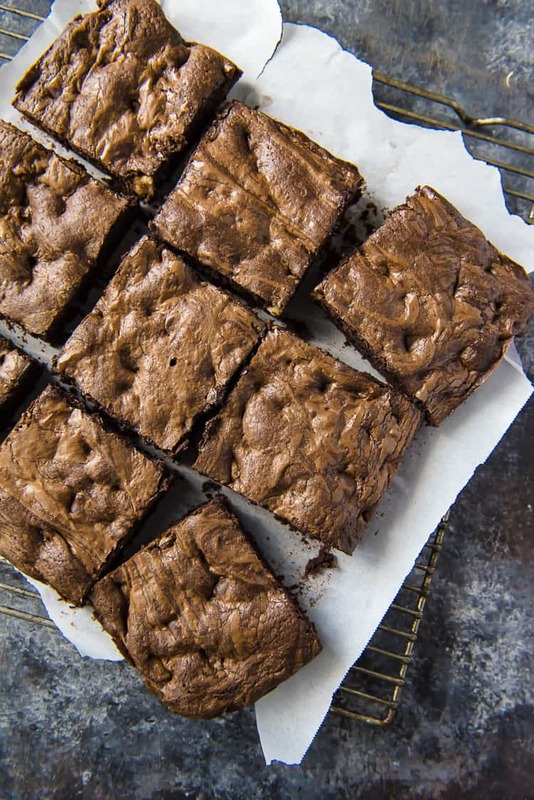 Can Brownies Be Made Without Oil? Yes! If you’re not a fan of using olive, avocado, or coconut oils vs. vegetable oil, you can substitute an equal amount of melted or browned butter. Just know that you’ll end up with a more cakey brownie instead of a fudgy brownie. Butter is milk fat, but that milk is also partially made of water – you’re not getting 100% fat. When using oil, a full-fat ingredient, you end up with those super fudgy, luscious brownies that sometimes never make it longer than a day. It’s really a personal preference. There are multiple factors that determine how your batch of homemade brownies will turn out. Every ingredient plays a part. Fat: Oil, as a neutral fat, will allow the chocolate in the brownie to come through. 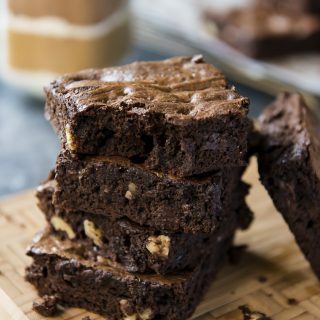 Alternatively, butter will add a bit of extra flavor, but reacts with the baking powder to help the brownies rise – creating a cakier texture. Sugar: Many brownie recipes call for plain ol’ white sugar. Brown sugar has molasses added to it, meaning it has a higher moisture content than granulated sugar. Using a combo of the two (with brown being a higher ratio) makes for a nice chewy, moist brownie. Eggs: Eggs contribute the most to fudgy brownies, especially the yolks. Using extra yolks in addition to whole eggs in your brownie recipe creates an even chewier texture. 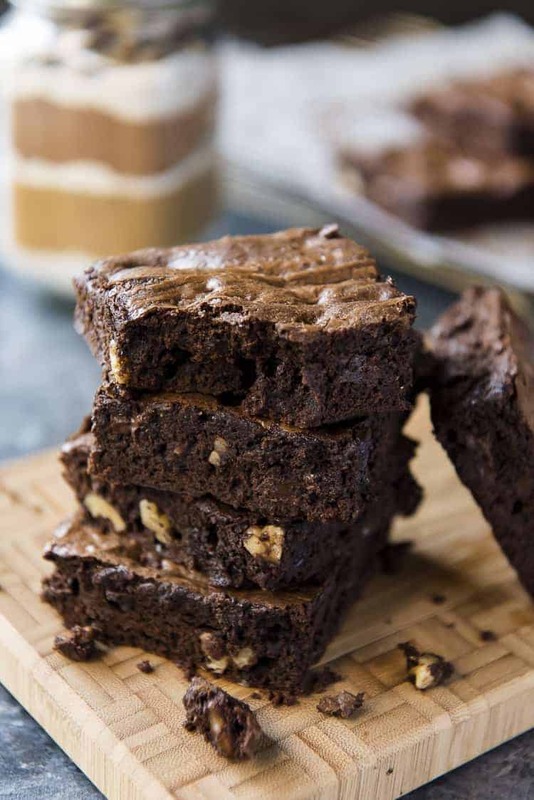 Chocolate: Generally, cocoa powder is used in cakier brownies, while melted chocolate in the base helps contribute to the moisture in the final product. As long as enough moisture is added to keep the dry to wet ratio balanced, cocoa powder can be used to create fudgy, chewy brownies, as well. Another factor that contributes to moist brownies is baking time. 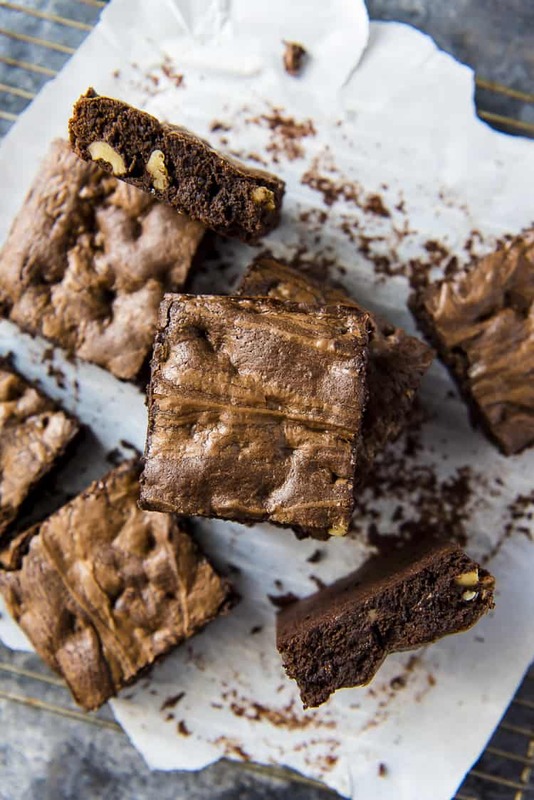 Brownies, as with all baked goods, continue baking for a short time after they’re removed from the oven thanks to the residual heat in the pan. When testing brownies for doneness, begin checking about halfway through the bake time. You want slightly clumpy, moist crumbs to stick to your tester instead of it coming out dry as with cake. How Long Does Homemade Brownie Mix Last? 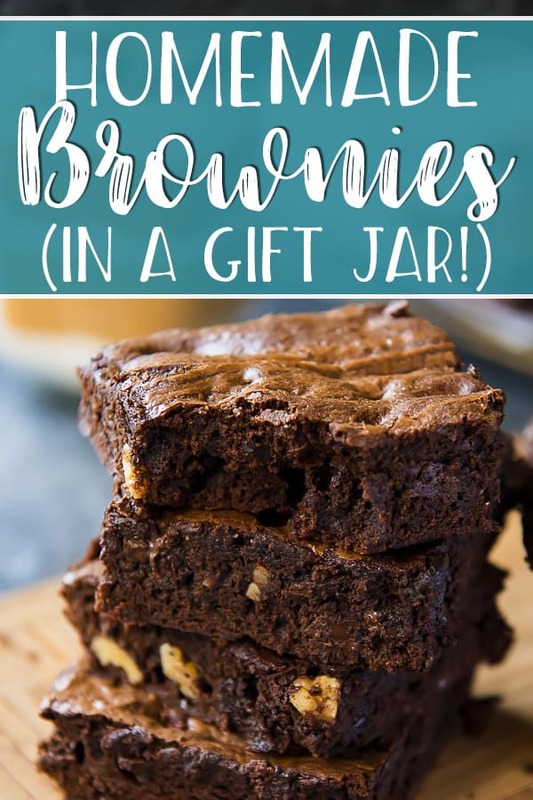 Assuming the freshest possible ingredients were used when making it, a sealed gift jar of brownie mix can last 5-6 months when store in a cool, dry place. What Ingredients Go Into Homemade Brownie Mix? How Do You Use Brownie Mix In a Jar? Whisk eggs, oil, and vanilla extract together in a large bowl until combined. Add contents of brownie mix jar to the bowl. Stir until just combined. Transfer batter to a greased, parchment-lined 8×8 or 9×9 baking pan. Bake at 350 degrees F for 20-25 minutes, until moist, clumpy crumbs appear when you insert a toothpick into the center. LOOKING FOR MORE RECIPES PERFECT FOR GIFTING? Once you've made a batch of Homemade Brownies, you'll never use a box mix again! The perfect blend of fudgy and cakey and jam-packed with chocolate, your family and friends will love receiving this one bowl brownie recipe (minus 3 ingredients!) in a gift jar for the holidays - or just because! Preheat the oven to 350 degrees F. Lightly grease an 8x8 or 9x9-inch cake pan and line it with parchment paper. Set aside. Combine vegetable oil and sugars in a large bowl and mix. Add eggs and vanilla extract, beating well. In a separate bowl, whisk together flour, cocoa powder, salt, chocolate chips, and walnuts. Add to wet mixture and fold together until well-combined but not overmixed. Pour batter into the prepared pan. Bake 20-25 minutes, or until moist, clumpy crumbs appear when you insert a toothpick into the center. Combine vegetable oil, eggs, and vanilla extract in a large bowl and mix well. Add the contents of the jar and mix well, ensuring there are no flour pockets, but not overmixing. Place a large funnel in a 16 ounce Mason jar. Pour the ingredients through the funnel in the following order, tapping the jar against the table to even layers out as you go: sugar, brown sugar, half flour + salt, cocoa powder, remaining flour + baking powder, chocolate chips, walnuts. Close jar lid tightly, wrap with a festive ribbon and attach instructions: "Mix well with 3 eggs, 1/2 cup oil, and 2 teaspoons vanilla extract. Bake in a greased 8x8 or 9x9 baking pan at 350 degrees F for 20-25 minutes, until a toothpick inserted comes out with moist crumbs on it." PIN THIS HOMEMADE BROWNIE RECIPE FOR LATER!